My husband and I needed another vacuum for a vacation home. We already have a Rainbow it is 20 years old, but didn’t want to pay that much for a second home. My husband found this one on O. I was a little worried about it being refurbished but we have had it 3 years and use it pretty often and have no problems at all. I would recommend this vacuum in a heartbeat. I love my original Rainbow and my new old Rainbow as well. Rid your home of allergens and dust bunnies with this Rainbow vacuum cleaner reconditioned by GV. Also includes many new quality aftermarket parts and accessories, made to fit Rainbow Vacuums. This canister vacuum cleaner includes an extensive set of tools and attachments to ensure the quick,efficient clean-up of every nook and cranny in your home. It features two speeds and an automatic shutoff feature to help prevent accidents. GV is in no way associated with the Rexair company. This vacuum was reconditioned by GreatVacs, not the Rexair company. 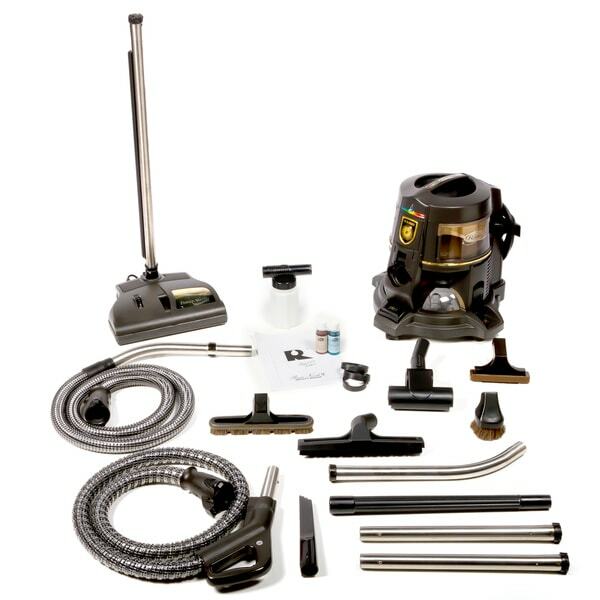 Every GV and aftermarket part included or used with this vacuum is quality tested and designed to fit and work flawlessly with Rainbow vacuums. You can tell that this set was pieced together. The parts work together, but sometimes need a little help staying together. We had to put a rubber band on the wand to keep the floor attachment on. I still havent figured out how to work the upholstry tool. BUT, you get what you pay for and this was significantly cheaper than a new ******* vacuum! First one ordered was wrong vacume. Overstock sent replacement in decent amount of time but couldn't use because wrong wand pipes. Aftermarket tools are poor quality and don't fit. So frustrated! Overstock texted to say issue would be resolved in 3-5 days. Sounds like they will send the missing pieces but the time spent straightening this mess out is crazy....i will update when I hear back on what they are going to do to for the very poor customer service so far. My sister has this same product and she has had it for over 25 years with no problems. My wife wanted a rainbow. "I'll start by mentioning that the box that I had just received my vacuum was falling apart. It had a hole in it out of which one metallic wand was sticking out. 1. I did not receive an owner's manual 2. The product description mentions a 5 year warranty but I haven't received anything mentioning a warranty in the box. There's actually no paperwork in the box at all 3. The carpet cleaner hose is deformed in 2 places and it's not round anymore 4. The carpet cleaner "contraption" that supposed to keep the bottom piece at a 90 degree angle until one is ready to start vacuum the carpet does not hold the attachment the bottom part in place, so when I lift the carpet tool by the wand handle it drops down. 5. Without the manual it's difficult to say what I have received. I got 2 items that I can't really identify what they are, which I am assuming are two of these. In either case it seems that I am missing at least one additional item here. one (1) hand-held shampooer, one (1) turbo brush mini head, one (1) famous squeegee tool attachment 6. Lastly, when I turn on the vacuum, there is a pause for about a second then the engine starts squeaking then when it is running the engine is very loud and it's mixed in with squeaking noise. That does not sounds right to me. We own the E1 model and it does not have any squeaking noise and it quieter." Hello alexander, I am so sorry for the condition that your package arrived in. You will contacted by Customer Care for further assistance. Thank you for shopping with us. "Who honors the 5 year warranty?" Thank you for contacting us, kaja02. The distributor will honor you the 5 years warranty. Please let us know if you have any further questions. "If I purchase this vacuum and it needs work done to it included in the 5 year warranty plan, who pays for shipping and how does it work for the work to be done?" Hello cahull, We will have a customer care specialist contact you. Thanks for shopping with us! "Can be used on the 220V outlet?" Hello, jajcheung. Unfortunately, this will not work on a 220 volt outlet. The plug is designed to work in a regular 120 volt outlet. Thanks for shopping with us! l.b. "Just ordered this and did not receive an owner's manual. Also the product description mentions a 5 year warranty but I haven't received anything mentioning a warranty in the box. There's actually no paperwork in the box at all, All I've received are the parts and vacuum." Thank you for your inquiry; you will be contacted by Customer Care. Have a great day. "Does this model have a HEPA filter? What is the major difference between the E2 GOLD and BLUE platinum pet series?" Hello parenz, Yes it does have the HEPA filter. In fact it has the washable HEPA filter. The only difference between the Gold and the Blue E2 is that the Blue model is a few years newer and it has a extra filter around the motor so it runs quieter. The Gold E2 is not loud or anything but on air purifying mode (speed 1) on the Blue they wanted it to be really quiet. Have a great day!